I like applying coconut oil for my hair but in winter I prefer organic oil blends which are warmer or pure almond oil. Last winter my sister who is a huge moroccan oil infused hair care fan suggested I give Argan oil a try and I started using it by mixing it with almond oil. Argan oil is an essential in my haircare routine for almost a year now and these days Iam using it on my skin too. When Speaking Tree wanted me to test out their argan carrier oil I just said a big fat Yes and here is my detailed review of their argan oil. Packaging of Argan carrier oil is same like the essential oil from this brand. It comes packaged in a tinted blue bottle with a screw cap which is leak proof. The bottle has a nozzle which dispenses right amount of product. and there is also an extra empty sleek roll on glass bottle in which you can transform some oil and use on face, lips, under eyes or even like perfume ittar. I really like the packaging and think it was a very good idea to include a roll on bottle which I find myself using a lot. I put some argan oil in roll on bottle and apply it on my face. The roll on has a metallic ball which also soothes my skin. Extracted from the kernels of argan tree, argan oil is also called moroccan oil and has many skin and hair benefits. It is a naturally moisturizing, healing and anti ageing making it a craze with beauty industry in recent times. 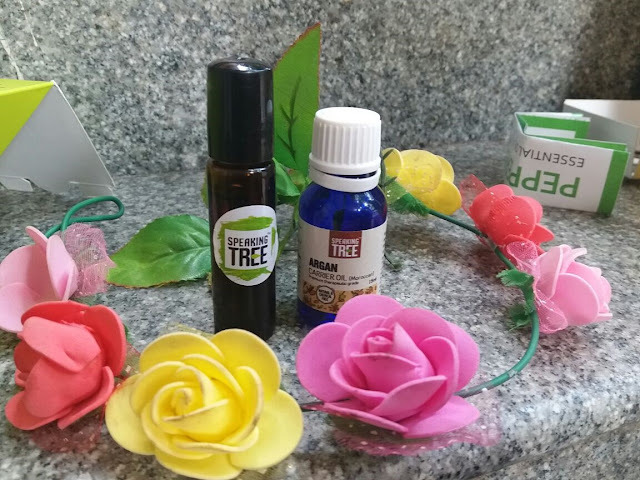 If you really want to benefit from goodness of argan oil try 100% pure oil from speaking tree. 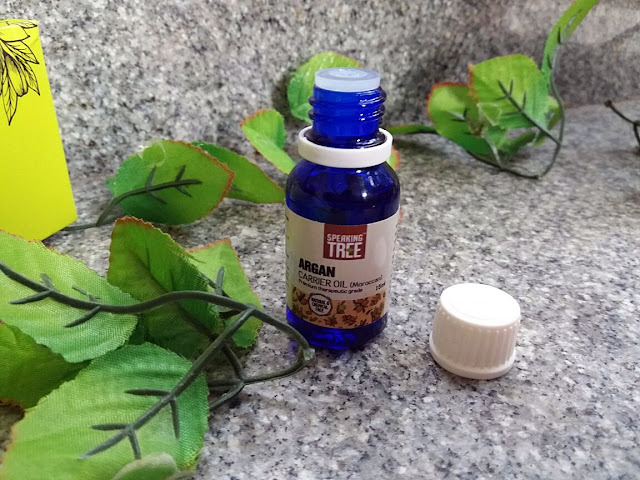 Argan oil from Speaking Tree is transparent and has a runny consistency. I use this oil mostly on m hair and sometimes on my face too and it works well both ways . For my hair I take some oil on my palms and apply directly into my hair and it gets absorbed easily . Sometimes When I am in mood to pamper my hair I mix almond oil, argan oil, coconut oil and olive oil in equal quantities and apply 30 minutes before having a bath. This oil is lighter than heavy oils like olive oil so I apply it on my hair ends even after bath like a serum of sorts. I love using this oil on my hair as it makes my dry hair soft, smooth and manageable without the chip chipy greasy feeling. After my trip to lucknow where I had a lot of hard water baths my hair had becomes dry and brittle and when I arrived back in my city I started using speaking tree argan oil and now my hair looks a lot more healthy and silky. I must say argan oil is a miracle oil especially if you have dry frizzy hair like mine. For my skin I mix a drop of argan oil with a drop of rosehip oil and apply in the night on my face and wake up to nourished and soft face in the morning. This oil gets absorbed easily into skin and works well for dry skin. Argan oil is rich in antioxidants and vitamin E which boost cell production and prevents ageing. A friend of mind also uses this oil on stretch marks and she says it works amazingly on them. Argan oil is also known to strengthen nails, just masaage a drop of oil onto your nails and cuticles before going to bed. Argan oil is an excellent moisturizer for both hair and face and will work well for all skin types. If you have dry skin give carrier and essential oils a try. 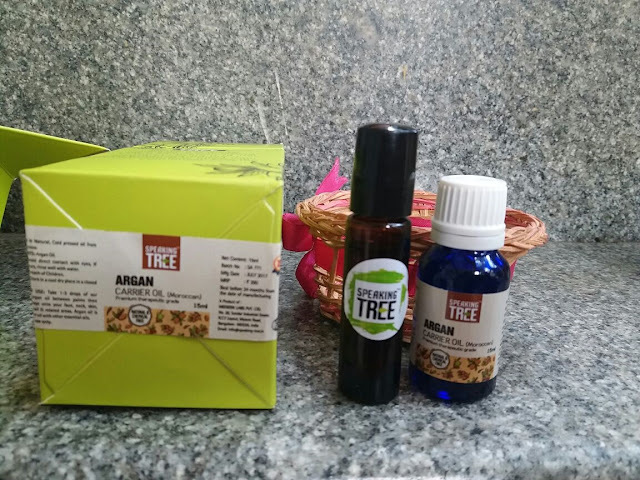 Argan oil from speaking tree is organic and cold pressed which has anti ageing benefits too. Natural products work slowly but the results are definitely worth the wait. I suggest you try natural argan oil on skin and hair instead of buying expensive argan oil infused products which have overload of chemicals, silicones and sulfates present in it and less than 10% of argan oil in them. We need to eat a balanced diet to stay healthy and live well but are we really getting all the vitamins and minerals our body need from food? Most of us are busy and skip on healthy food turning to food which doesnt meet out daily nutrient needs. Even home cooked food isnt exactly healthy because a recent study shows that even organic fruits, cereals and vegetables have some content of pesticides in them. To keep your body healthy you can take help of vitamin supplements but ofocourse taking too much or taking these supplements for too long is not advisable. 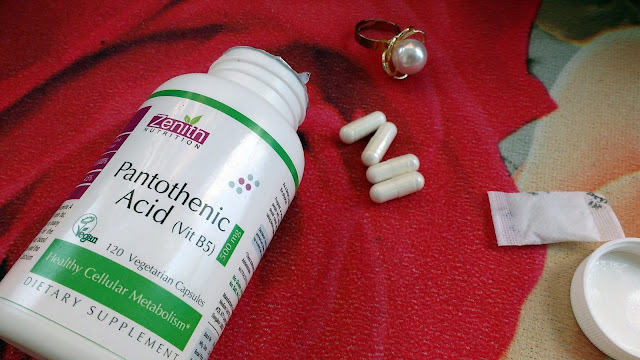 Today in this post I will be discussing Vitamin B5 which helps body use fats and proteins and I will also be reviewing Pantothenic Acid (Vitamin B5) Capsules from Zenith Nutrition. 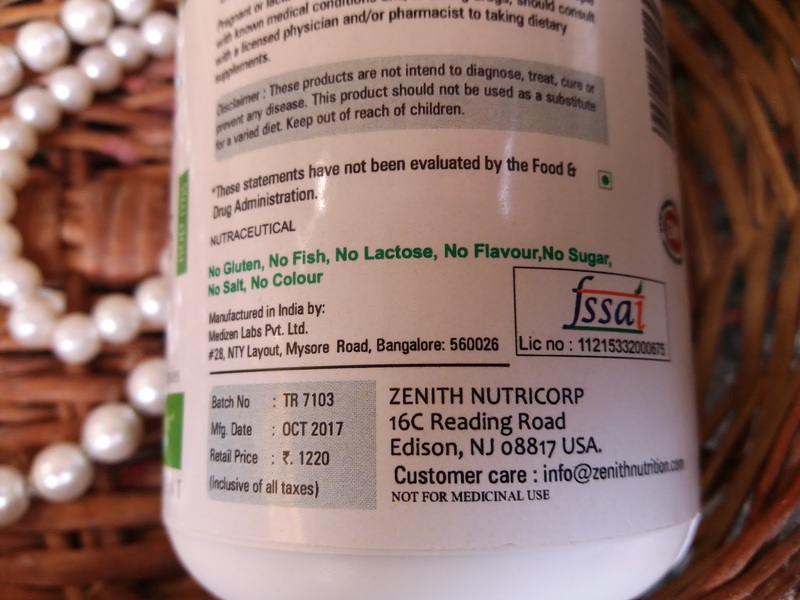 These Pantothenic acid capsules from zenith nutrition come packaged in a plastic bottle. Simple fuss free packaging. 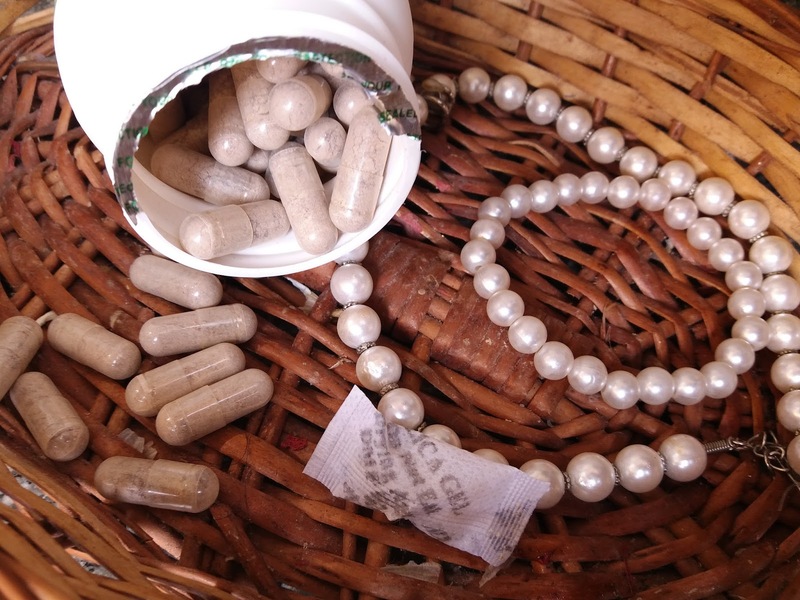 The capsules itself are pure white in colour and the size is of normal capsule which makes it easy to consume. Vitamin B5 is also referred to as Pantothenic Acid, is one of 8 B vitamins which help body absorb carbohydrates, proteins and fats, converting them to energy which impacts the overall health of skin, hair, eyes and liver. 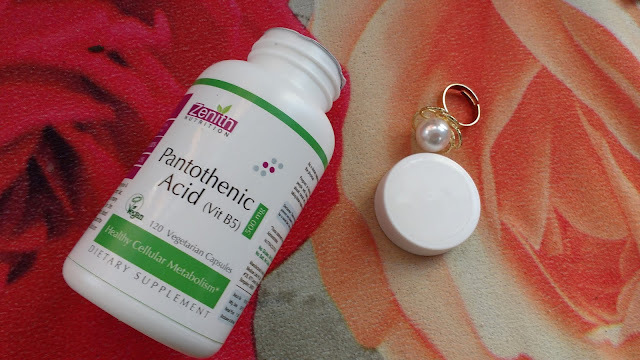 Vitamin B5 (Panthothenic Acid) has many more benefits for human health. It helps in manufacture of red blood cells. So my sister got hitched more than a month back in Lucknow and it was an amazing week of celebrations but it was quiet stressful too. I had to travel by train and the climate change also affected my health a bit and I had some unexpected skin problems. 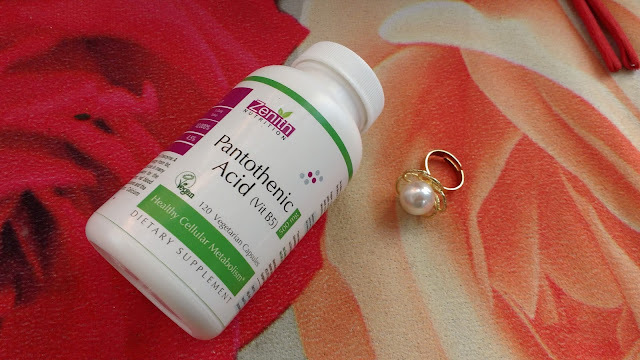 I started taking Pantothenic acid capsules mainly to help with my skin issues and I have seen a lot of improvement. These capsules help with acne and also clears up skin. I also noticed I was able to sleep better which helped with my under eye bags and overall health. You should consult your doctor before having these if you are pregnant or breast feeding. I take one capsule a day but you can take more than one a day because pantothenic acid is water soluble and body doesnt store it . These capsules are known to help with anxiety and stress to a great extent so if you or anyone in your family has stress you can give this supplement from Zenith nutrition a try. Zenith Nutrition offers quality vegetarian supplements which are free from toxins and heavy metals. These capsules are also free of flavour, colour, salt, sugar and lactose. 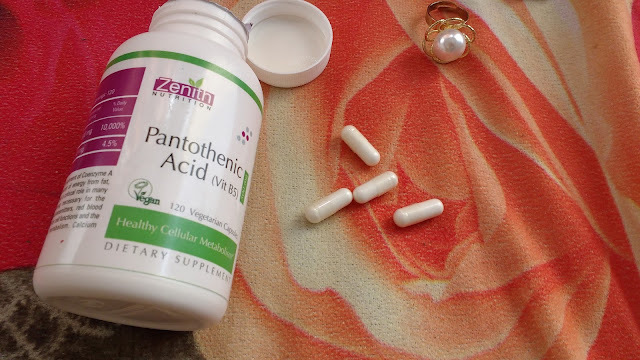 Zenith Nutrition Pantothenic acid helps with cellular metabolism which impacts your overall health. These capsules also helps reduce stress, anxiety and help better sleep quality. If you want to give your body that extra boost than include these vegetarian capsules in your diet.Totally recommend! In recent years it may be hard to remember what dating used to be like. Back in the day, if you have not met your beloved other half at high school or university - you probably met him/her through friends, at a home party or at a bar, despite the imposed stereotype of not being able to meet anybody trustworthy at a place like that, it still happened. Have you ever found yourself reminiscing about how it all was going in the good old days? When a guy would approach a girl he liked, ask her phone number, jot it down and only then he would call her and ask her out on a conventional date. It was some sort of a tradition…a plan involved. It was made in advance, when both sides agreed to meet at a certain time and place. If they truly loved one another, after a certain period of time they both made their feelings clear with no hesitation. It used to be a seamless, natural flow of events, with minimal thought behind it. You got to know someone you liked and you ended up with him/her in a healthy long-term relationship. Nowadays single individuals have a whole another approach to dating. Online love has taken its shift. All this digital dating revolution all started with such a source of communication as text messaging. Being able to share thoughts in such a simple manner, at any time or any place paved the way to a lot smoother type of connection. The contemporary digital generation developed as single people gained the opportunity of reaching out to their dating options at night or simply in the spur of the moment. Making a phone call or even arranging a private meeting takes more courage and could possibly be considered rude, but hitting some buttons and forging a nice greeting message is not a big thing and is never disruptive. These days people even got used to break up with each via messengers and video chats, or sometimes not breaking up, but just turn a deaf ear to each other’s messages. Isn’t that plain easy? No conversations on high tones, no awkward eye contacts - just temporary unpleasant feelings of rejection and confusion for the person, being ignored, still everyone moves on eventually. Whatever gadget you’re using – a laptop or a smartphone, digital dating has become a solid alternative to conventional dating as it is much easier and usually leads to better results. From what we’ve come across while getting this article prepared, romantic meeting online is much more effective as it gives you more control over who you are chatting to. And since a great deal of dating sites and apps come up with special filters that enable users to point out what type of potential match they want to meet and what personality types they don’t wish to see at all. Yeah, there are particular downsides of online romancing, especially if you have a problem navigating through low-quality profile pictures and messages drown in poor spelling and grammar and (it comes in a separate row) the use of CAPS LOCK. 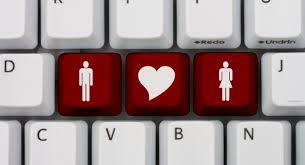 Nevertheless, digital dating gives that convenience and flexibility that is missing from ordinary dating. Dating online, you can meet an attractive person almost anywhere, at any time and, if he/she turns out to be a mismatch, move on to the next with a simple swipe. You can do it even when at the bar with friends! Unlike the pre-digital era in romantic dating, when the biggest worry was whether your crush would call you back or not, today we are provided a truly amazing chance to find a worthy partner without even stepping outside the room. And once we land the partner and proceed for a relationship, there are also quite a number of online opportunities the traditional dating can never ensure. Thanks to our friends from ukrainian video dating for providing this article. 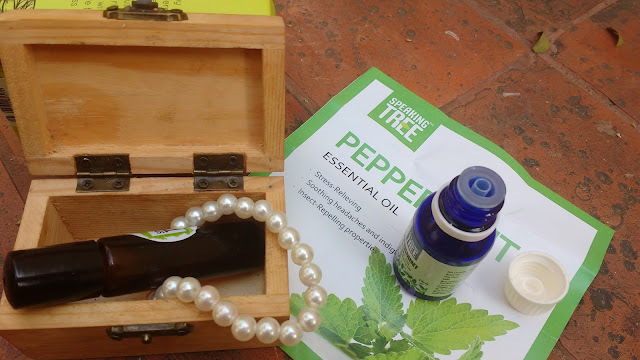 Speaking Tree 100% Pure and Natural Peppermint Essential Oil Review.. I have a thing for beauty products with mint in them. I love how refreshing, cooling and calm mint flavored bath scrubs and lip balms are and so when I got a chance to test out peppermint essential oil from Speaking Tree I said yes in a jiffy. 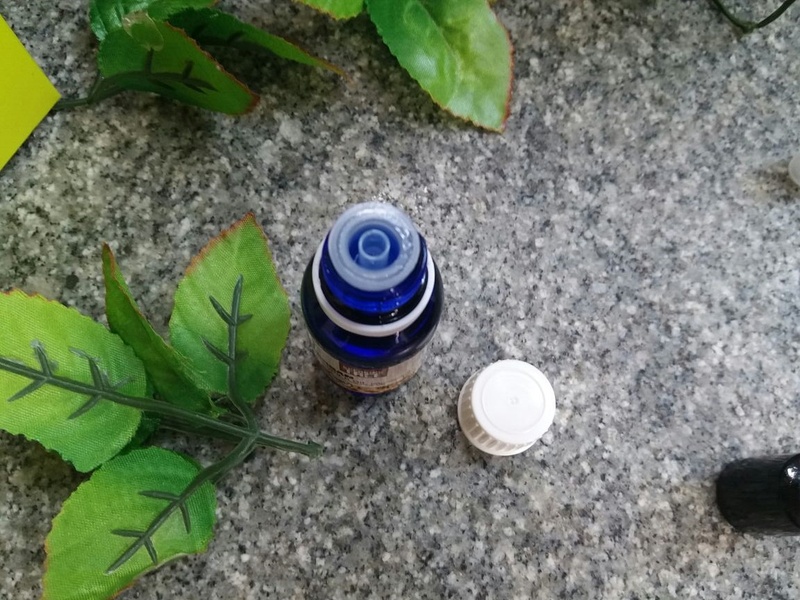 I have been using this essential oil in several different ways for the past two weeks and now here I bring to you a detailed review. 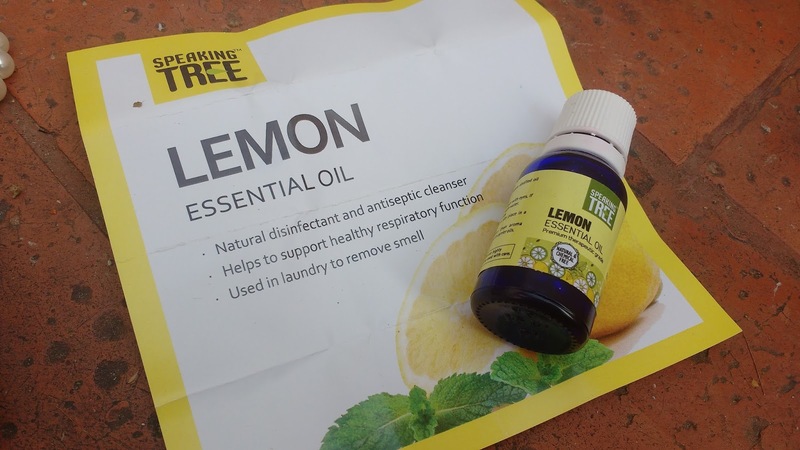 Speaking Tree’s Lemon essential oil is 100% natural and organic. It contains premium therapeutic grade Peppermint which has many benefits for your body and soul. 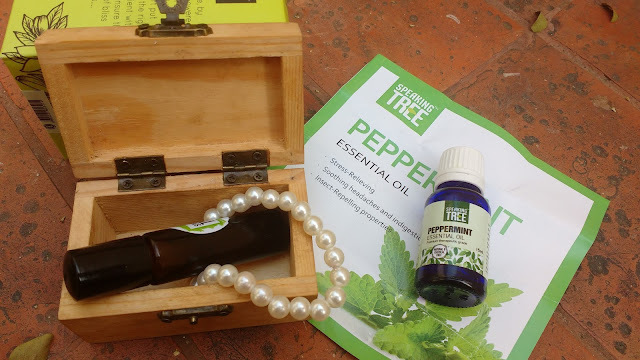 Peppermint Essential oil from Speaking Tree comes packaged in a green cardboard box which has all necessary details printed on it. Inside the cardboard box is the actual Peppermint essential oil bottle which is tinted blue to maintain efficacy . The oil has a white screw cap which is leak proof and a stopper nozzle to dispense oil drop by drop. The cardboard box also houses an extra empty sleek roll on glass bottle in which you can transform some essential oil and use on face, lips, under eyes or even like perfume ittar. I really like the packaging and think it was a very good idea to include a roll on bottle which I love using. Peppermint essential oil has a very strong minty aroma. The minty smell is fresh and natural and kind of calms and relaxes you. I have used many mint infused beauty products, the cooling sensation and aroma is just divine. Speaking Tree Peppermint oil is 100% pure and steam distilled having a strong minty aroma. I find the fragrance very strong and quickly dilute the oil in almond oil to lessen the intensity of minty scent. Peppermint oil from Speaking Tree is transparent and has runny texture and it gives a soothing and cooling effect when applied on skin but essential oils should always be diluted before application. There are many ways you can use peppermint essential oil. I mostly add a drop of this oil in my hair oil and apply into my hair for a cooling and relaxing hair massage. I find massage with a mix coconut oil and peppermint oil can help when Iam very stressed or have a light head ache. 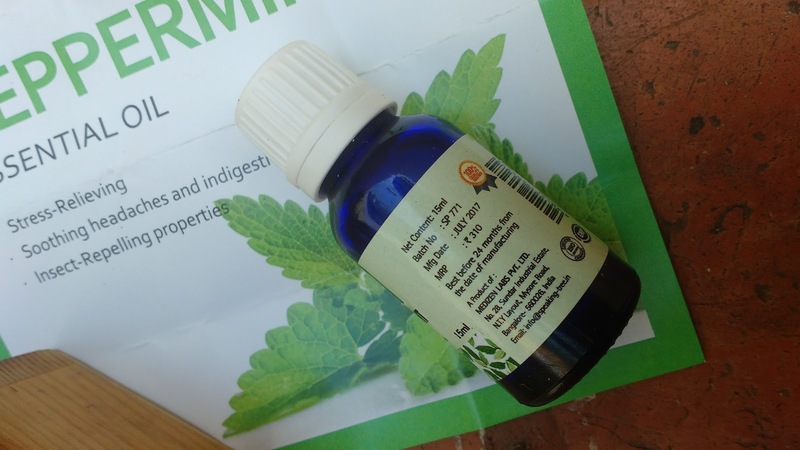 This oil also works nicely like a massage oil soothing muscles and providing pain relief. For massage I add some drop of peppermint oil to olive oil. Peppermint is widely used in hair care as it helps keeping dandruff away and also promotes hair growth. I added few drops of peppermint oil in my regular shampoo and it felt heavenly almost like hair spa at home. If you like mint infused shampoos give this DIY peppermint in shampoo a try for relaxing bath. This oil is pure and the aroma is a lot stronger than minty scents you might have smelt in other mint related products . 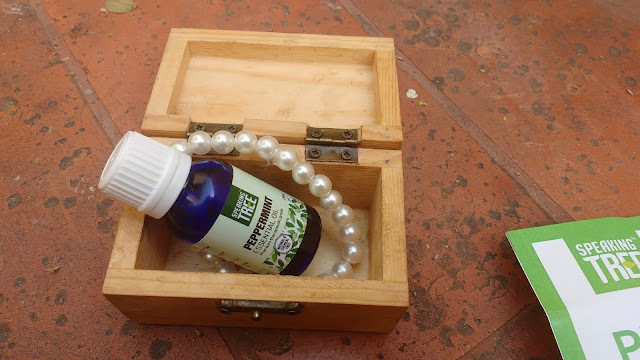 The place where I store this essential oil smells strongly of mint even though I keep the bottle tightly screwed so, I have put the bottle inside a drawer . Wet a cotton ball in peppermint oil and place in corners of home to repel insects and bugs. Sooth tired or swollen feet with a relaxing foot soak. Add some drop of this oil in warm water and soak your feet. 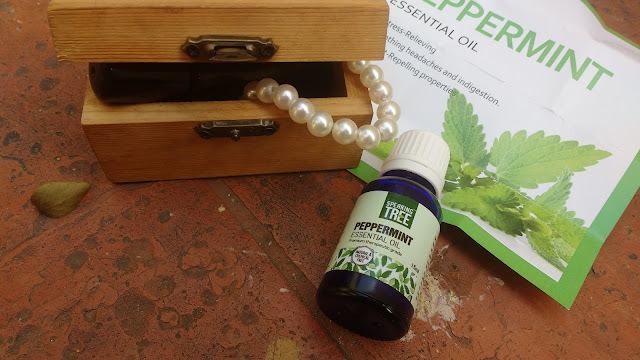 Do I recommend Speaking Tree Peppermint Essential oil ? Yes, This is a very soothing multi purpose essential oil which everyone must have in their home. I am totally loving Speaking Tree peppermint Essential oil which is a miracle soother in a bottle. You can use this oil in variety of different ways and I add this oil to my face pack, hair oil, body scrub, shampoo and face wash too for a fresh soothing beauty treatments. This oil relaxes me and i cant get enough of it. 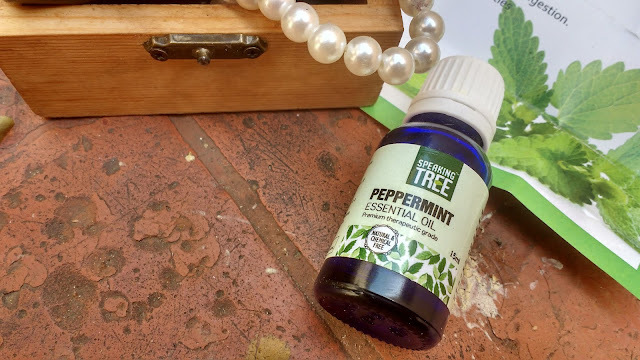 If you love your beauty products to be mint infused, use Speaking Tree peppermint Essential oil which is 100% pure, natural and decently priced. This oil is also good to be used for medicinal purposes. I love using oils on skin and I have been including more oils in my beauty regime. Almond oil for my under eyes, mix of argan oil and coconut oil for hair, Rosehip oil for face and it has all been working well for my skin. 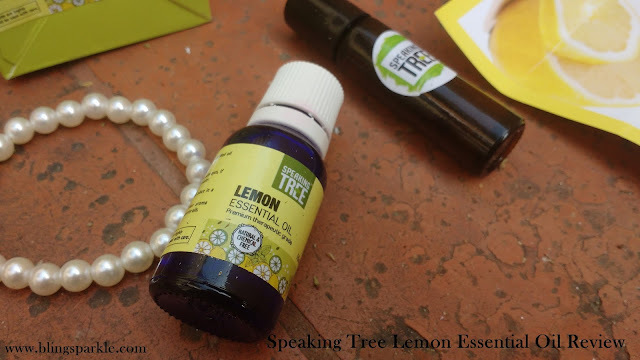 I have been hearing a lot about the benefits of essential oils from international beauty bloggers and wanted try them myself and so, I was very exited to try the Speaking Tree lemon essential oil. Today I will be sharing my experience with this essential oil and also talk about ways to use lemon essential oil for health and beauty. 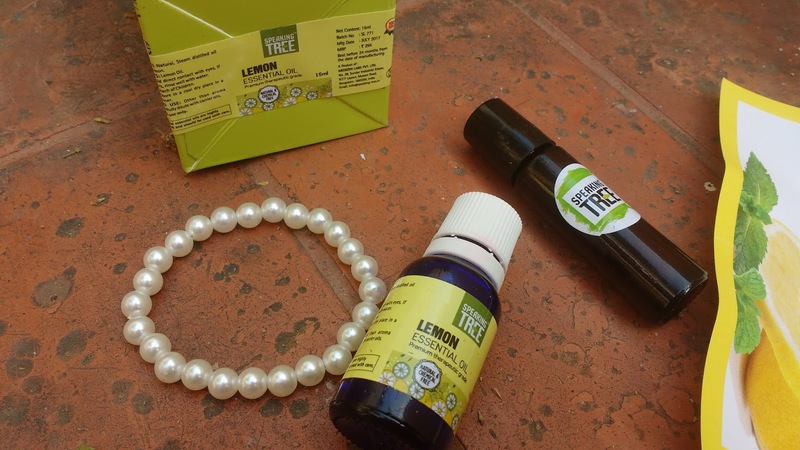 Speaking Tree’s Lemon essential oil is 100% natural and organic. It contains premium therapeutic grade Lemon which has calming and detoxifying properties. 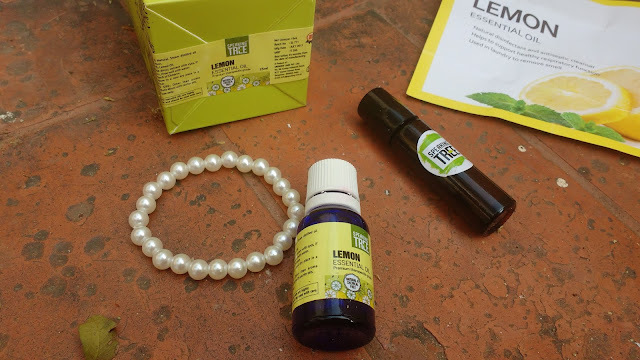 Lemon Essential oil from Speaking Tree comes packaged in a green cardboard box which has all necessary details printed on it. 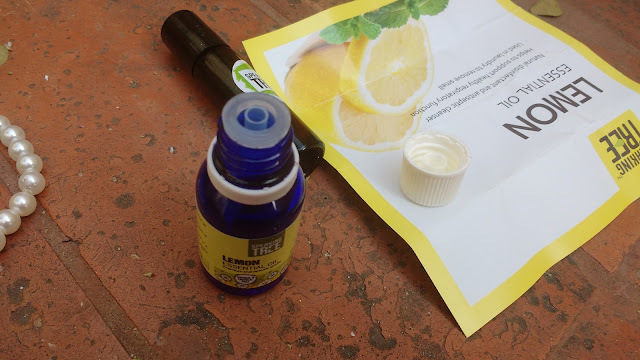 Inside the cardboard box is the actual lemon essential oil bottle which is tinted blue to maintain efficacy of the pure oil and it has a screw cap which is leak proof. The bottle has a nozzle which dispenses right amount of product. The cardboard box also houses an extra empty sleek roll on glass bottle in which you can transform some essential oil and use on face, lips, under eyes or even like perfume ittar. I really like the packaging and think it was a very good idea to include a roll on bottle which I find myself using a lot. This is a pure essential oil so it naturally has a strong lemon scent and I find the scent very calming and refreshing. If you love perfumes with citrus notes you will love this oil . On the flip side this relaxing lemony fragrance doesnt last long. It was the first time I was using lemon essential oil so I was very excited. The speaking Tree lemon essential oil is transparent and has normal light oil like runny consistency. Essential oils are very strong and should always be diluted with carrier oils before application on skin. I mix almond oil with lemon oil when using on skin and for hair I mix this with olive oil and it works well reviving my skin. Sometimes I also mix a drop of this oil in my moisturizer and apply on face before going to bed to even out skin as lemon has skin lightening properties. Mix a drop of this oil in you face pack for rejuvenated, soft supple skin. Dilute some drops of lemon oil with coconut oil or olive oil and use on hair to eliminate dandruff. Add some drops of lemon oil in a bucket of bathing water for a refreshing aromatic morning bath. Add a drop of lemon oil in your face wash for cleansed, supple and even toned skin. My favourite way to use lemon essential oil is in a diffuser to uplift mood as I love citrus scents. Lemon oil is helpful in treating pimples and acne as it has antiseptic properties. Always do a skin sensitivity test before using any essential oil. Mix a drop of lemon oil with a spoon of almond or olive oil and apply on your inner elbow. Check for rashes or irritation and use on face after 24 hours. It is good to use lemon oil during night or indoors as Lemon essential oil is photosensitive. Do not apply this oil if you are about to expose skin and hair to sunlight. Always buy pure essential oils like the Speaking Tree Lemon Essential oil. Dilute essential oils in carrier oil before use on skin and hair. 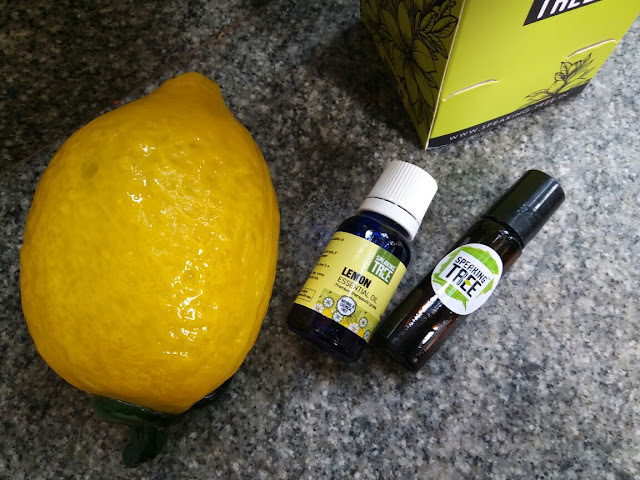 Do I recommend Speaking Tree Lemon Essential oil ? Yes, Do give it a try if you love citrus scents or have oily skin. 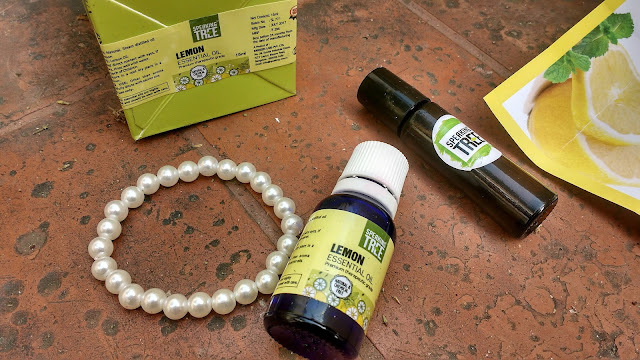 Overall Speaking Tree Lemon Essential oil has many benefits for skin, hair and home and you should give it a try if you love chemical free organic skin and hair care. This oilis pure, organic and works for all skin types and a pleasant lemony aroma which can help bust stress and promote positive feelings. 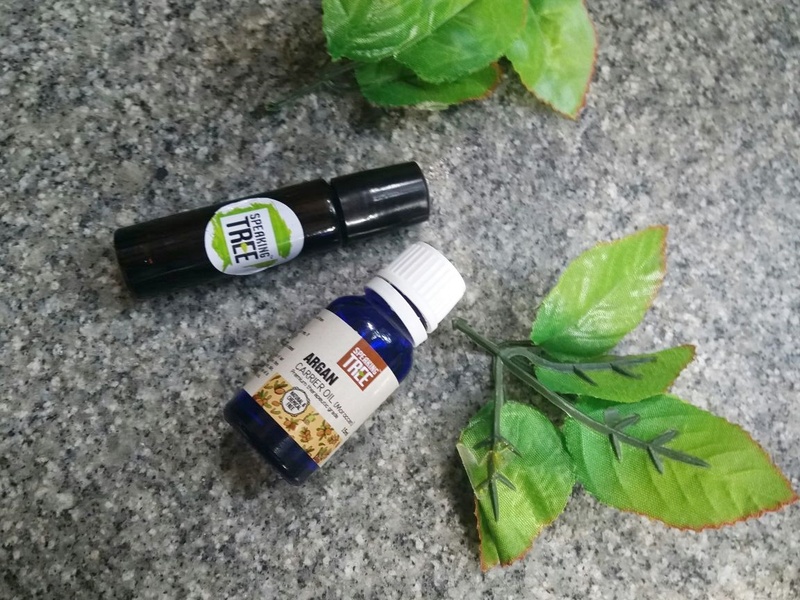 If you havent yet tried essential oils I suggest you start with this oil or go for tea tree essential oil from Speaking Tree. Join Expert's Glucosamine Chondroitin With MSM - Best Joint Relief Supplement In The Indian Market? Joint Expert's Glucosamine Chondroitin MSM is a dietary supplement that claims to stimulate cells to help build joint cartilage. Joint Expert's Glucosamine Chondroitin MSM is formulated in such a way that the Glucosamine Sulfate helps in creating the main building block of the joint cartilage , proteoglycans. Apart from helping build joint cartilage , Joint Expert's Glucosamine Chondroitin MSM also lubricates the joints , which in turn increases the joint flexibility. 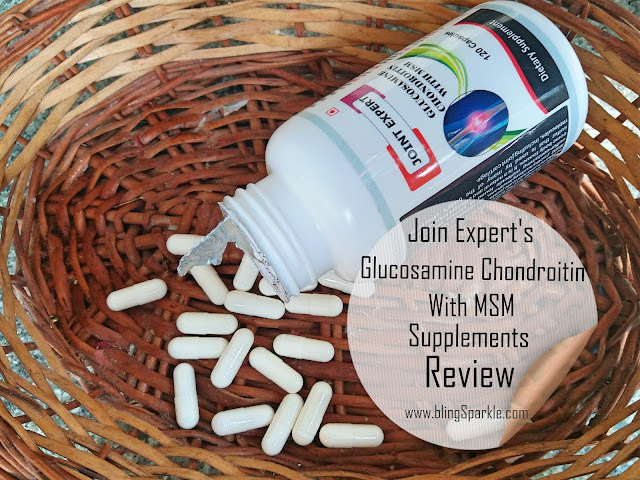 What is Join Expert's Glucosamine Chondroitin MSM ? How Does It Help People With Joint Pains? Join Expert's Glucosamine Chondroitin MSM is a product that claims to help promote healthy joints with the help of three essential ingredients Glucosamine Sulfate, Chondroitin Sulfate and MSM (Methyl sulfonyl methane). This particular dietary supplement when taken religiously for a long term period (more than three months) claims to give you amazing results and helping in the reduction of joint pains to a great extent. The product is made by a renowned company 'Join Expert'. You can take Join Expert'sGlucosamine Chondroitin MSM confidently knowing that it is prepared by real professionals. How Does Join Expert's Glucosamine Chondroitin MSM Work? It is well known that the combination of glucosamine sulphate, chondroitin sulphate and MSM is one of the most effective formula for joint problems. This synergy works like a charm because each of the ingredients compliment the others. Glucosamine Sulfate being a natural compound stimulates the building of joint cartilage while Chondroitin Sulfate helps nourishing and lubricating of the joints. 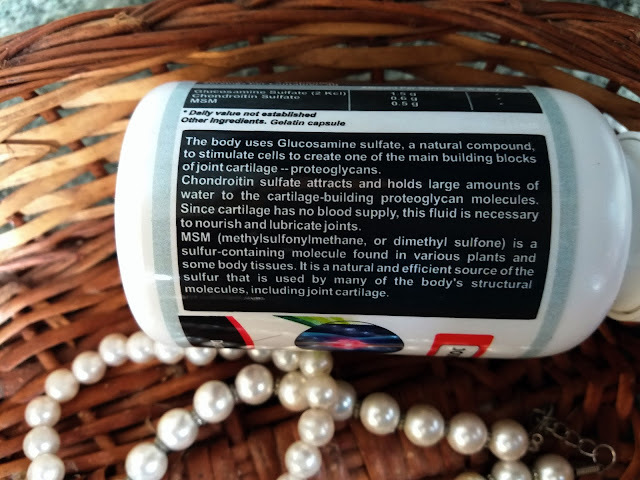 Chondroitin Sulfate attracts large amounts of water to the cartilage-building proteoglycan molecules as the cartilage has no blood supply and the fluid created by the process helps in lubricating the joints , therefore helping in better joint movement. MSM or Dimethyl Sulfone,derived from certain plants and body tissues is a natural and efficient sulfur source used by our body's structural molecules, including joint cartilage.MSM also has high sulphur content which is also good for other body parts like skin, hair and nails. 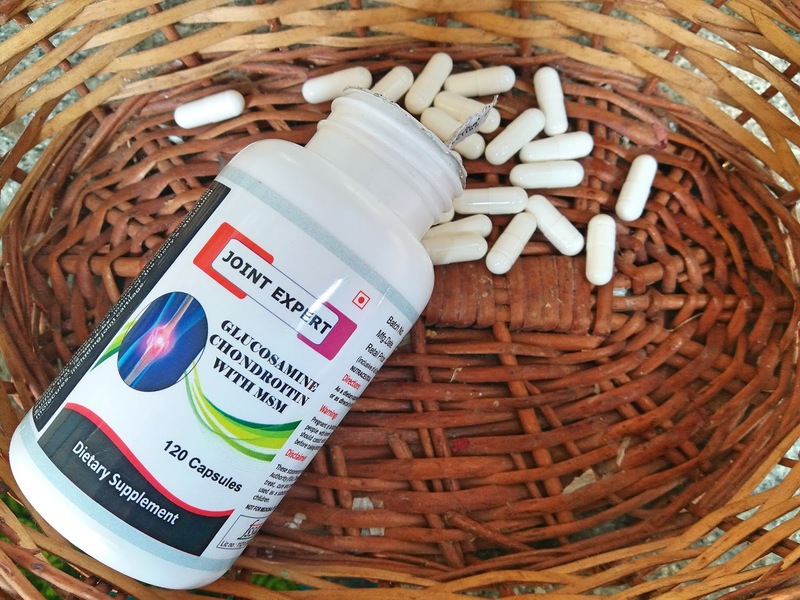 Join Expert's Glucosamine Chondroitin MSM provides three important nutrients which help maintain healthy joints and connective tissue (1) glucosamine,(2) chondroitin and (3) Methylsulfonylmethane . It has the ingredient Glucosamine sulfate which helps in joint health and is a major nutrient for joint lubrication and better joint movement and flexibility. It also has MSM which supplies bio-available sulfur required for joint health. The capsules are made from gelatin and contain shellfish derived from fish and crab. It claims to stimulate cells to help build joint cartilage. The capsules are packaged in HDPE (High Density Polyethylene) bottles. HDPE bottles are meant to keep moisture vapor out, protecting the freshness and integrity of their contents. 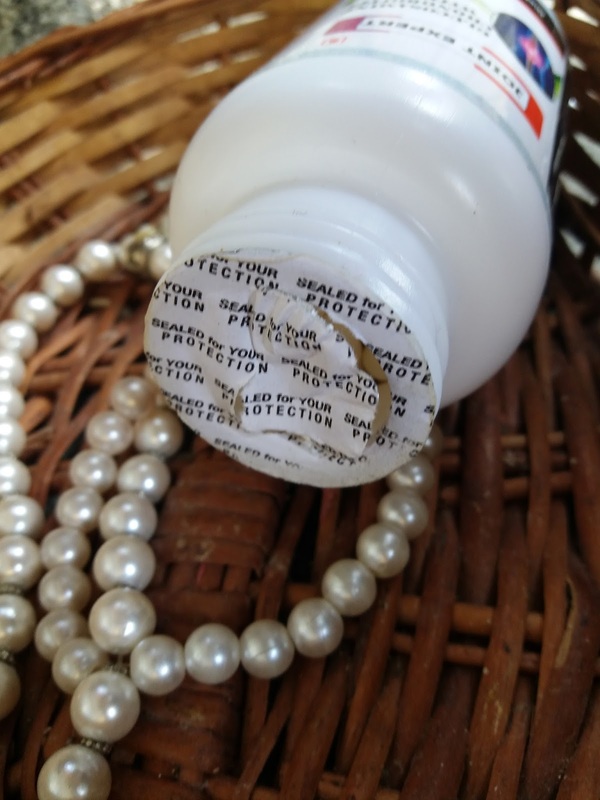 And the cap of the bottle is sealed to perfection.The packaging is up to date and gets a big thumbs up from our side. Best before 18 months from the date of packaging. The recommended dose is 2-4 capsule between meals. Or you can increase or decrease the dosage once you have got directions from your physician. Two capsules a day may be sufficient to help in reducing your joint pains. Pregnant or women breast feeding, diabetics, hypoglycemics and people with known medical conditions and/or taking medications, should consult with a licensed physician or a pharmacist before including this dietary supplement. Buy it from Amazon's Website here. Joint Expert's Glucosamine Chondroitin With MSM Supplement can be termed as a safe and effective supplement for building joint cartilage. It is an excellent way to reduce joint discomfort and increase joint flexibility. Given the price, its one of the most effective and budget friendly Glucosamine Chondroitin With MSM supplement in the market ! Highly recommended! What Is Tribulus Terrestris ? Tribulus Terrestris is extracted from a fruit of an annual plant from the caltrop family. Indian medicine is familiar with Tribulus Terrestris Plan for it has been used since ages in the Ayurveda disciple , believed to strengthen the body by building all the tissues.The herbal plant has a long history of uses. Tribulus is extensively used throughout the world to promote overall health and encourage muscle development. Tribulus Terrestris, commonly known as Gokshur in Sanskrit is found all over India and in some parts of Kashmir. Due to the big success of Tribulus Terrestris in addressing many male problems, it attracted the attention of Western medicine which lead to its extensive use in medicine and health supplements. 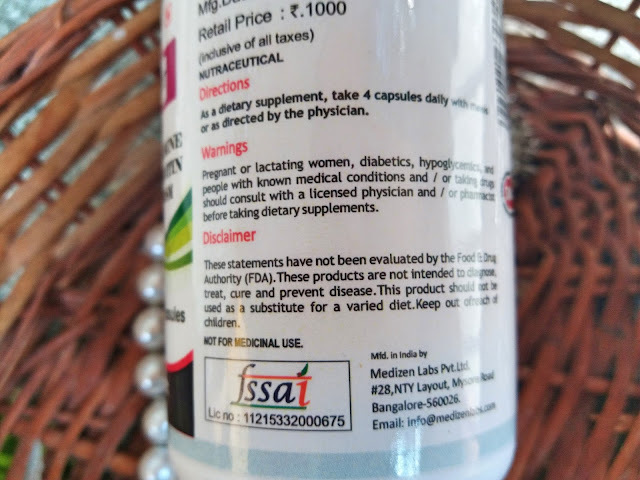 Lets review one such health supplement which claims to boost the overall health of men. What Is So Special About Zenith Nutrition Tribulus Muscle Building 800 mg Supplements? Zenith Nutrition's Tribulus supplements are derived from Tribulus plant containing 40% steroidal saponins which can help boost energy and strength levels of a man. 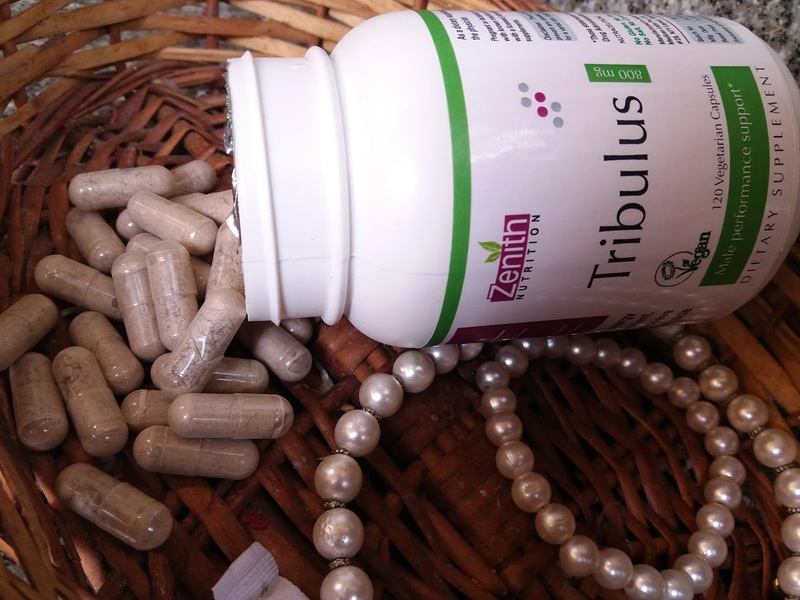 Zenith Nutrition’s Tribulus Terrestris dietary supplements are touted as an energy enhancing and body-building supplement which might help the male territory to achieve their athletic goals in weight lifting , in addition to it even claims to play a major role in the muscle development. Zenith Nutrition's Tribulus supplements are crammed with 40% Steroidal Saponins into every single capsule to help men achieve goals they've set for themselves and their body. If you are looking to add an edge to your fitness regimen and experience difference in your athletic performances you can invest in Zenith Nutrition's Tribulus Muscle building supplements. 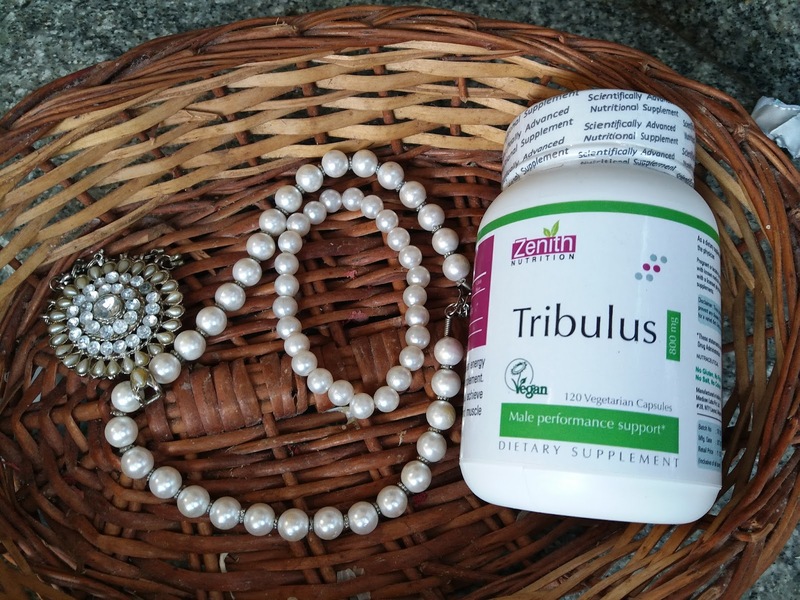 When taken on a regular basis Zenith Nutrition's Tribulus terrestris may turn out to be an excellent source for promoting the muscle gains competitors look for. Zenith Nutrition is a well known brand in the nutritional supplement department and provide few of the top products for health supplements. Many people have have found Zenith Nutrition's Tribulus supplements to be extremely effective for healthy muscle gaining and increased stamina as well. 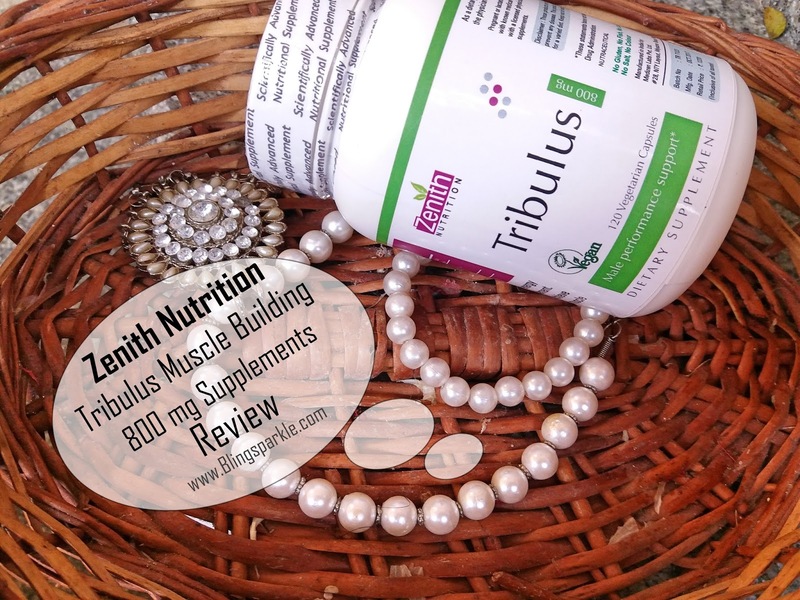 Lets take a look at the main features of Zenith Nutrition's Tribulus Muscle Building 800 mg supplements. Zenith Nutrition's Tribulus is suggested to support healthy levels of the body's main muscle building hormone in males. 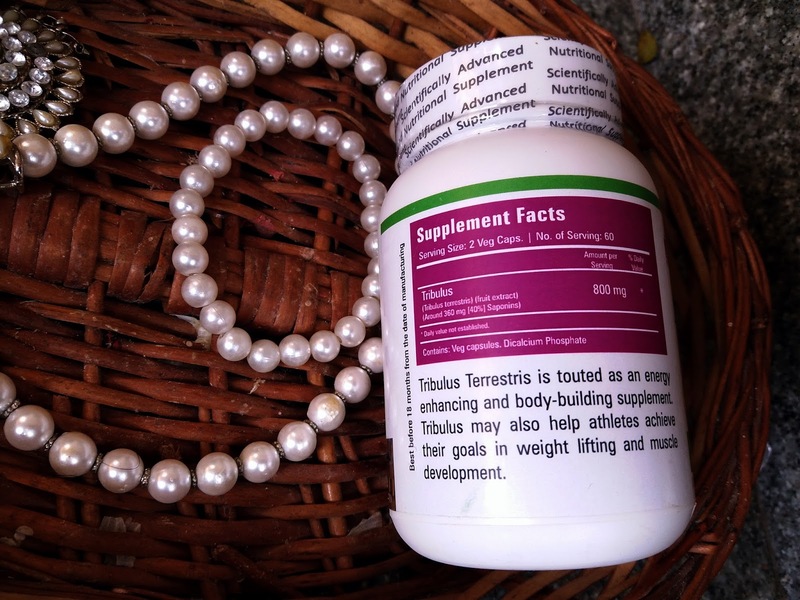 Helps in maintaining energy levels and contributing to body-building. Helps in staying fit and feeling energized. Tribulus is believed to support normal testosterone levels. Claims to support reproductive function. 100% vegan , therefore suitable for vegetarians. Enhances energy levels which seem to decline with age in a man. Supports overall health and muscle gain . Help athletes achieve their goals in weight lifting and unleashing their potential. Also helps athletes in achieving their goals by increasing their energy and maintain a better body! 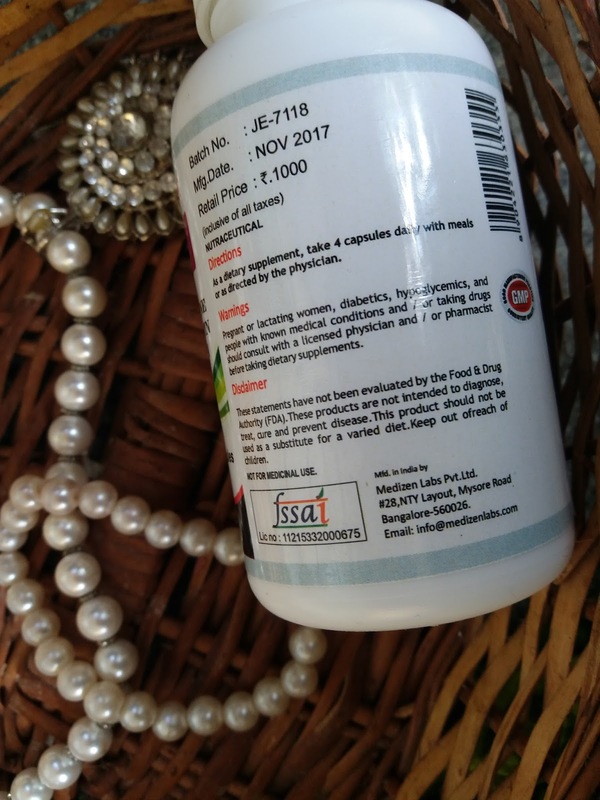 The cost of 60 capsules is INR 1220 of 800 mg each. The recommended dose is 2 capsules for a day with meals. Or you can increase or decrease the dosage once you have got directions from your physician. Two capsules a day may be sufficient to help you stay energized and perform better. You can buy it online on Zenith Nutrition's official website here. The Bottom Line - Should You Give It A Try? Zenith Nutrition Tribulus Muscle Building 800mg Dietary Supplement is amazing and may work wonders if it suits your body. It can be stated as one of the best muscle booster. The pricing factor is great as well as the performance which is absolutely amazing and meets all expectations. The quality is excellent and undoubtedly one of the best out there in the market. It may cover needs of many men who are looking for a good muscle booster supplement. If you are seeking increased energy, a better body, and the confidence to perform better in weight lifting , it is definitely worth a try! Its not just the women who tend to ponder over the question 'What to wear?' but even men face the challenge and become immensely unsure of deciding over what to wear ! If you think wearing a suit is the only option we are here to help you chose an engagement wear for groom which is not just a boring suit but much more , whilst not making a fool of oneself. If there was any better day to look good for you, it is your engagement day ! You might be wondering as to why, well gentlemen , this might be your last chance to leave an impression on your soon-to-be in laws. With Indian engagement parties having loads and loads of relatives in attendance , its your best chance to impress and convince them that you are the best match for their daughter and very much deserve their respect! Your engagement event is no way a time to experiment with looks and outfits. Its wise to play safe and ditch those loud designer wear or puzzling suits ! 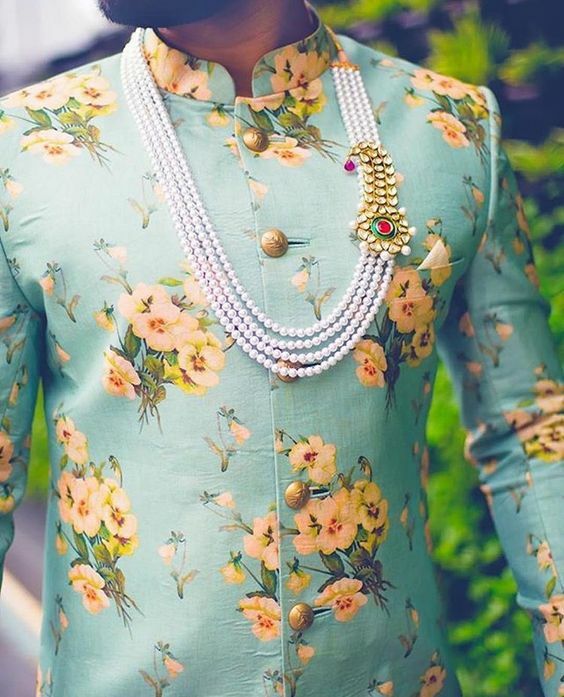 Your engagement ceremony is going to put you in limelight and you probably want to dress in such a way which gives a message you want to be taken seriously! Hence dressing for an engagement ceremony needs proper research and a little effort , that's it! You want to look formal and wear something which has ' I put in some effort' touch to it. Tried and tested classics and formal attire is best and we here at Blingsparkle have you covered on what to wear to your engagement party ! Dressing up on their special day is a task be it men or women. But dressing up for your own engagement can be a daunting one for men. One can wear a Sherwani for his wedding but when you are getting engaged , you are going to be the center of attention! 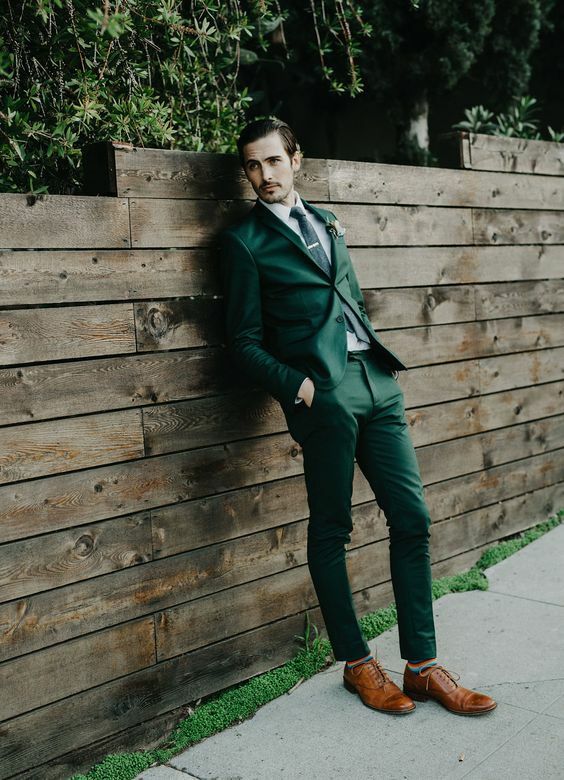 An engagement dress for groom might look like an unimportant thing but trust me guys it makes the most difference when your in laws and family is going to see you start your life in a good fitted suit. 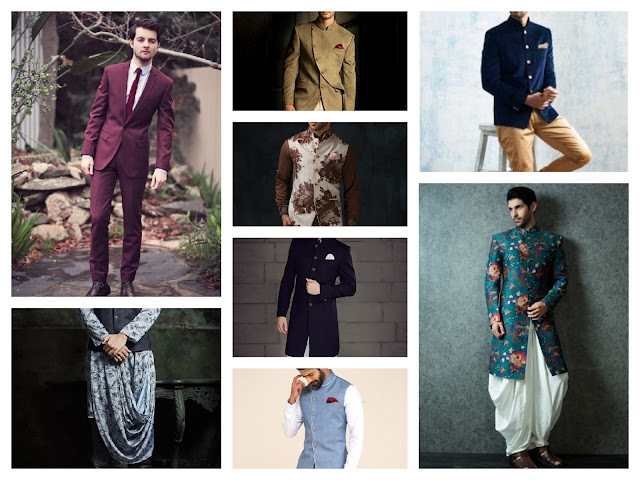 When it comes to Indian engagement outfits, Indian men have a lot of options to choose from. Lets take a dive into 20 engagement wear for Indian groom . When you are getting engaged, its best to stick to tried and tested classics but you can add your own elements of traditional touches to color coordinate with what your partner is wearing. You do not have much room for creativity but there are loads of outfits which will help you show off your personality and make you the star of the evening. Women might have loads of options when it comes to ; what to wear to an engagement party?' but men seem to have very limited options and hence I am going to help you find the most suitable outfit for your engagement ceremony! You can't go wrong with a stylish Bandhgala ! Pair it with a black kurta and a white chudidar pant. 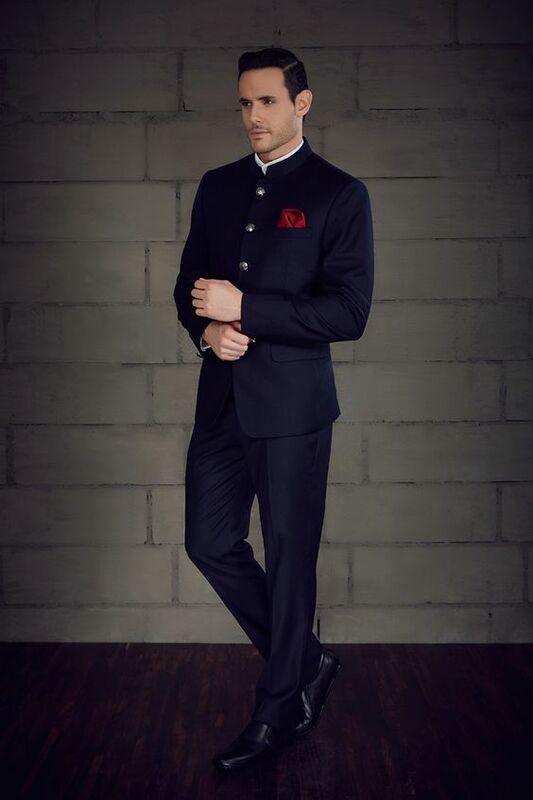 A stylish bandhghala in charcoal or black is sure to get you on the best dressed grooms list ! 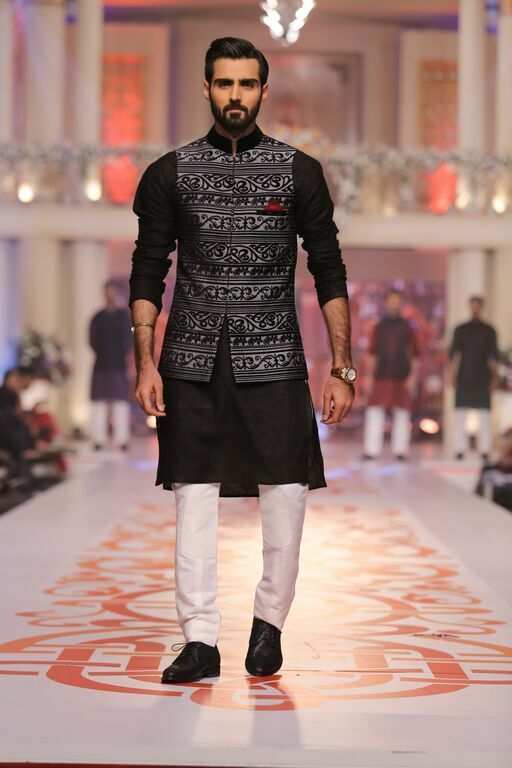 A classic Kurta-pajama is the ideal choice for a traditional engagement ceremony . Dress it up with a dark colored vest or dress it down with a waistcoat! 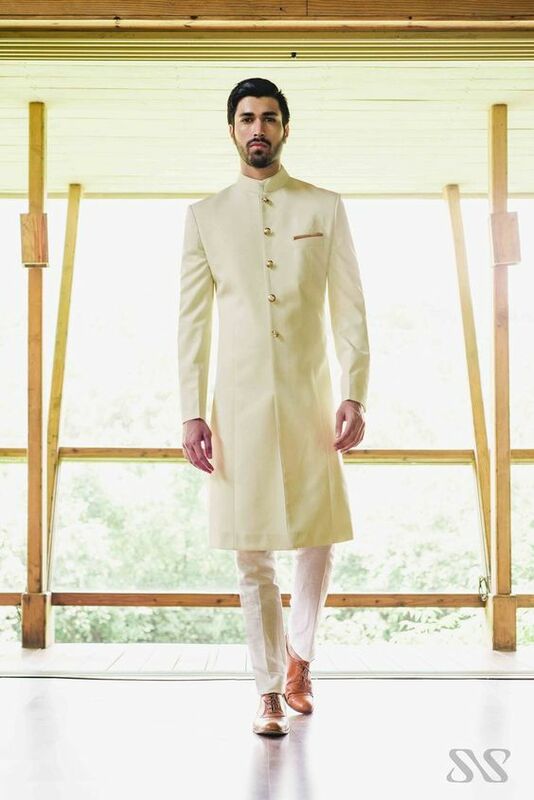 If you are a groom who wants to keep it elegant and sophisticated for his engagement then opt for off white long Bandghalas for a royal yet subtle effect ! 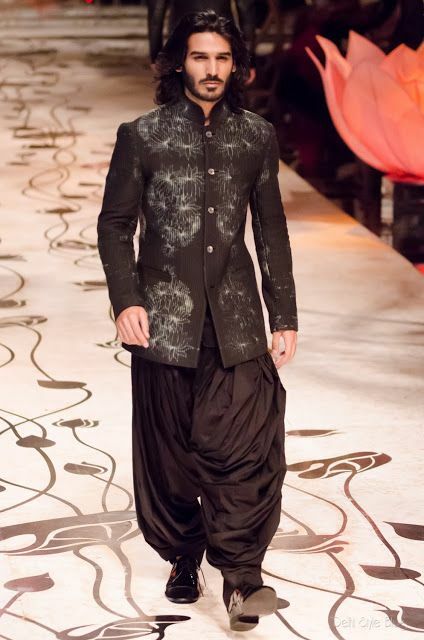 Indo-western sherwani's are in full swing this season for they not only look great but have an Indian touch to them ! 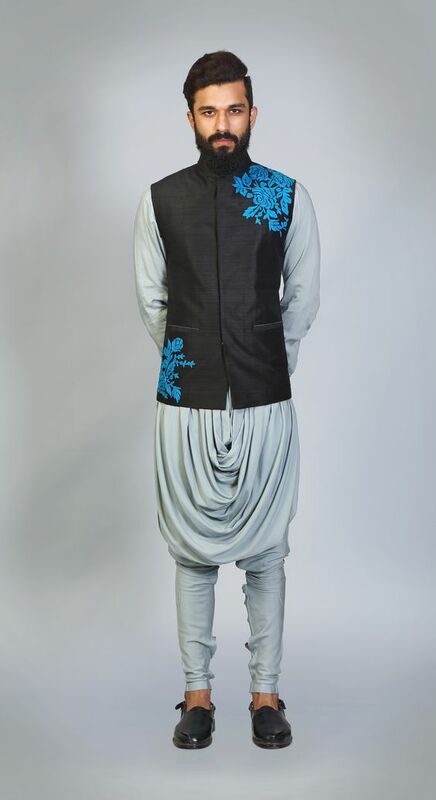 This dhoti style sherwani is a great way to impress your partners family! 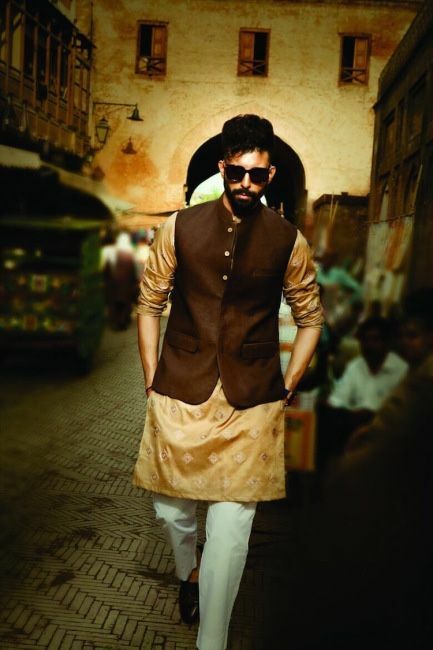 One can never go wrong with a pathani suit ! Pick a color that looks great with your complexion and it i sure to visually appeal everybody out there on your engagement! Ditch the basic color variants for a burgundy or a marsala colored suit! 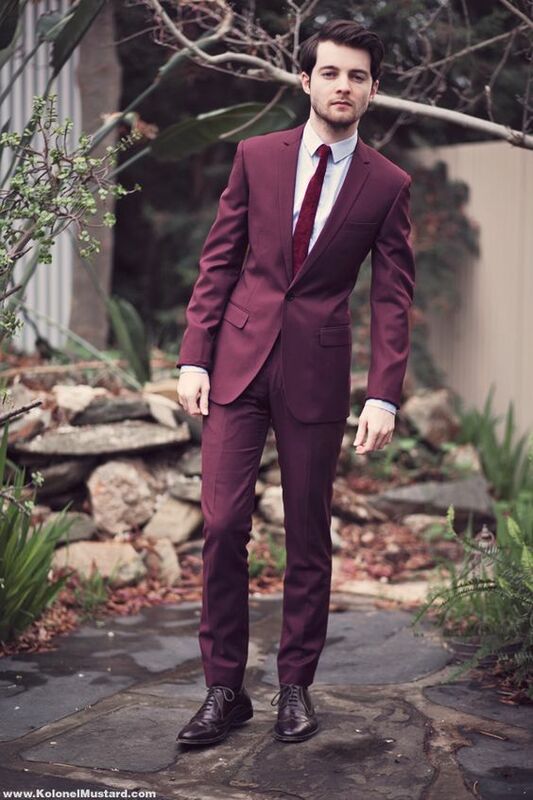 The rich wine colored suit is sure to make you the star of the evening, which you very much deserve ! the color would be a statement in itself ! 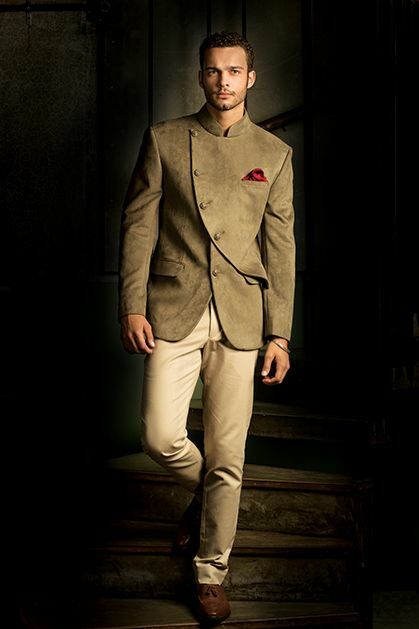 this would suit all complexions and dusky Indian men can carry of this color with ease! Or you could even spice up your bold slim fit suit with brown oxfords like the one here below..
Who knew plain western wear could look so much more awesome with just a Nehru jacket? Try this guys ! 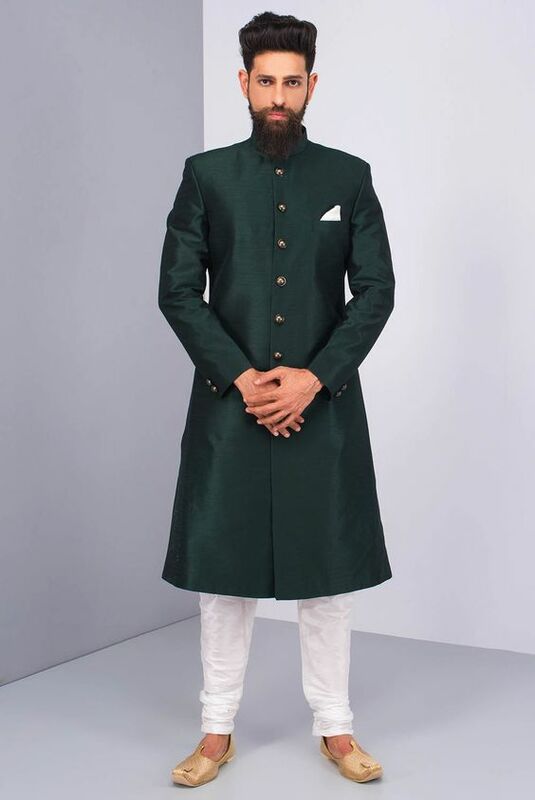 If you are having a huge ceremony with all the relatives in attendance , chances of you being overshadowed increase , which is why you can choose between a minimalist sherwani or a nawabi sherwani and stand out from the huge crowd, after all you are the one who is getting engaged ! 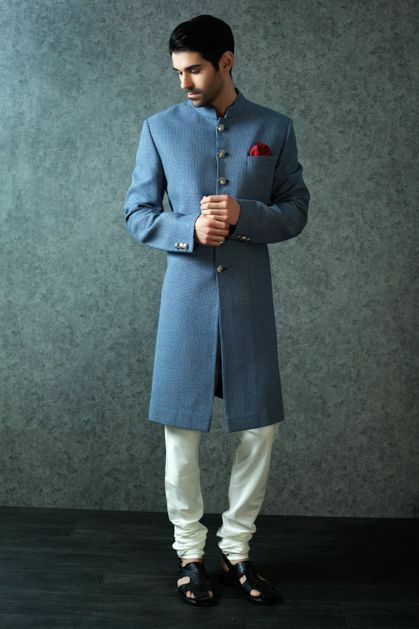 The most unconventionally stylish grooms would zero upon a Cowl kurta ! These trendy kurta features an asymmetric cowled draped tunic at front along with churidaar pants. 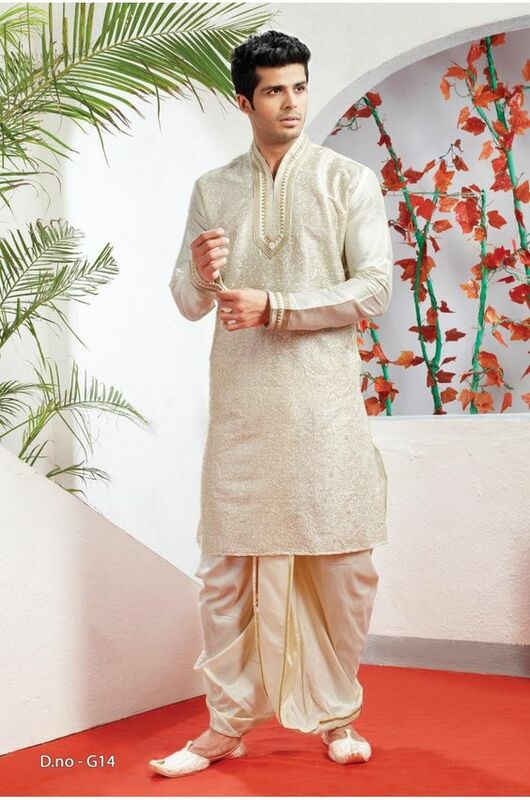 Looks absolutely stunning on men and is a great fashionable pick for your engagement ceremony! Wear your cowl Kurta with a vest or a waist coat to instantly lift your outfit and give it some glam factor! You are sure to look smashing with this one. 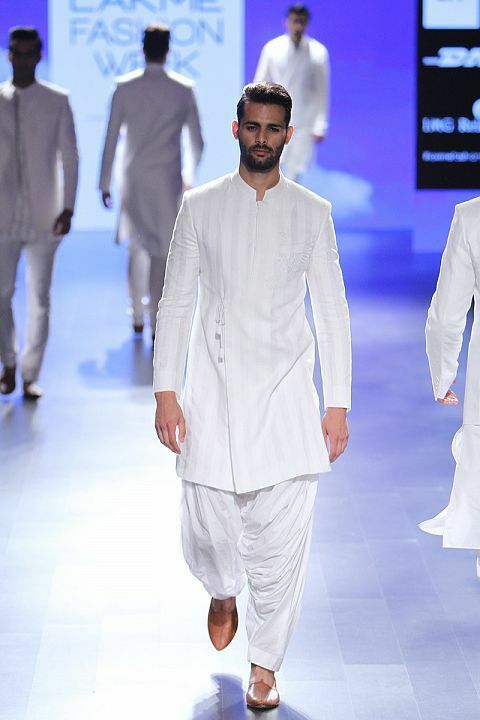 If you are the kind who likes to keep it fuss free and dressed down, you can wear an all in all white kurta -pyajama. Giving your attire a touch of royalty is also another option for you, you can d this by adding elements of velvet clothing pieces in your outfit. Velvet is just restricted to women , it is popping all over in men's fashion! Make a style statement at your engagement with it! It could be a vest or a jacket or even velvet pants ! 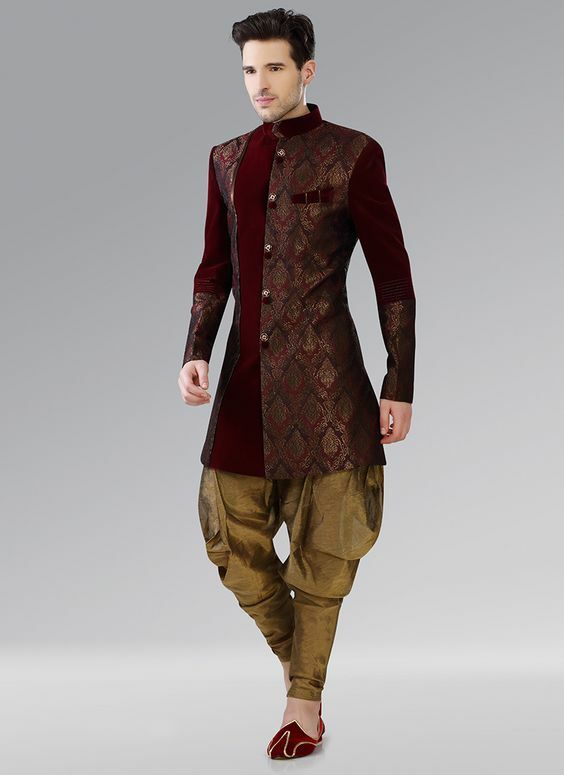 Engagement dress for grooms now mostly consist of velvet material suits! Gone are the days when florals were only associated with women and home decor! Embrace the florals this wedding season ! 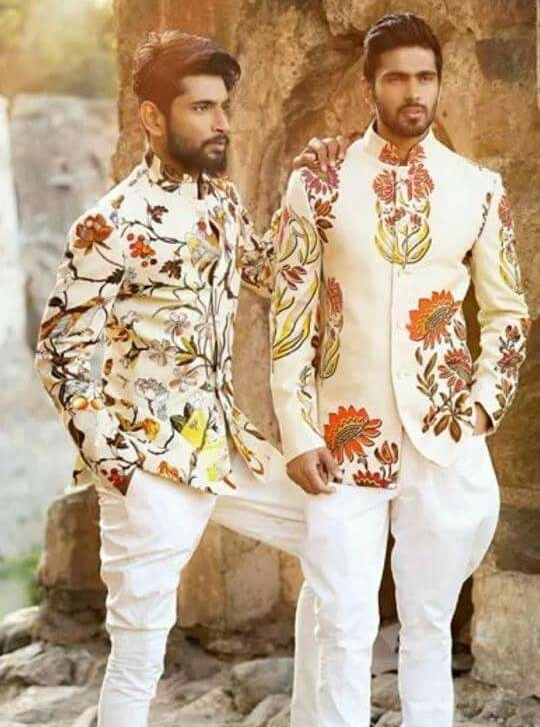 One of the most quirky and fun engagement dress for groom this wedding season are the floral printed sherwani and floral printed jackets. You are bound to look your most interesting and fun side with them. 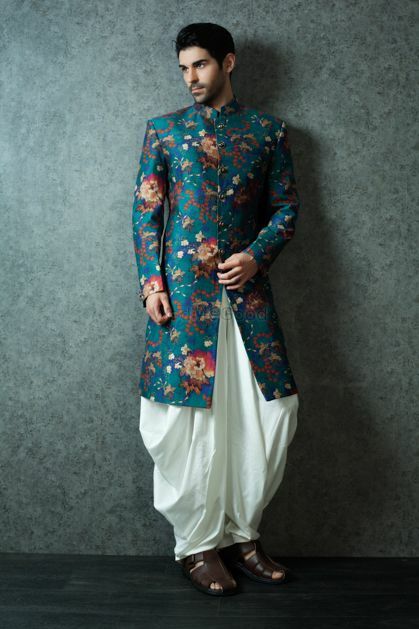 Do check out the floral collection by Sabyasachi and Rohil Bal , they have an excellent collection of floral men's wear which you can rock for your engagement ceremony! 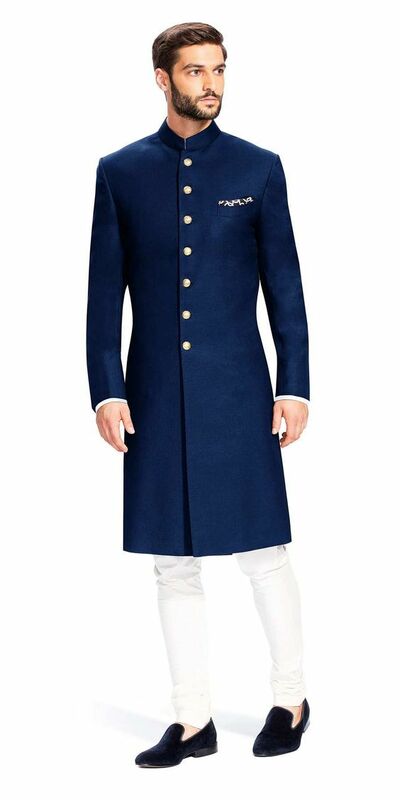 If you are one of those kind who wants to be the best dressed in his engagement ceremony, then don't settle anything but the best- the royal sherwani! Keep in mind the weaving, material and ornamentation and choose a color that brings out the best in you. If you are well built and are tall enough , you can fr heavy embroidery designer sherwanis in deep blue or maroon for that royal effect ! Pair it with Mughlai styled juttis to give that extra added effect! 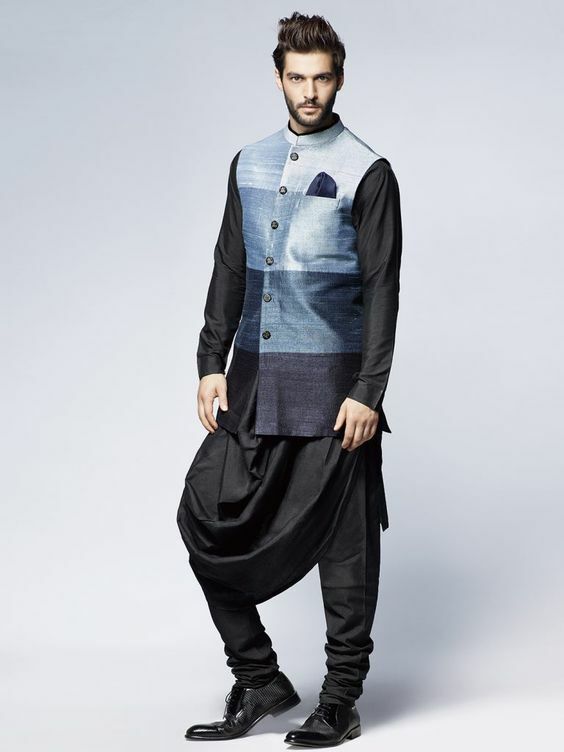 The market is flooded with trendy and designer kurtas for men and the latest to make an entry are the overlapping kurtas ! Chic, trendy and ethnic-they are here to make you look smart yet give the down to earth vibe. With a jacket like short kurta at the front, overlapping a traditional kurta , plus a matching pyajama, this dress will give you an elegant look ! This one definitely tops the list when it comes to latest engagement dresses for men for the year 2018 ! You can even add a pair of fancy pants or a well fitted pant in bold color to add charm to your whole outfit. If you are wearing a traditional kurta you can choose between a mughlai salwar, well fitted chudidars or pre-stitched dhoti pants. And if you are wearing a silk shirt or polo topped up with a blazer , you can go for a lighter or darker shade chino pants accordingly. Invest some f your time choosing the right pair of pants as this sure to get you the title of Best dressed in the category of engagement outfit for men. 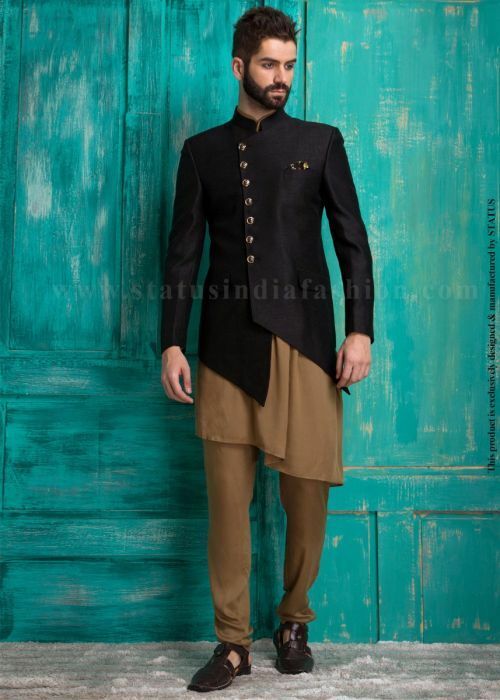 This Indo-Persian mix style of a sherwani is very popular when it comes to engagement dress for groom in India. A long knee length coat tailored to perfection is sure to make you stand out and make look exquisite on your very special day ! This another option and you have a variety of colors and styles to choose from ! If the word 'casual' is for you, then pick a semi-formal outfit ! Or if you are planning for a small celebration with just the closest of family and friends for your engagement ceremony, then a casual swagger look would do. Pick a trendy printed cotton shirt and pair it with a blazer. Or you could even wear denims with a well fitted jacket ! 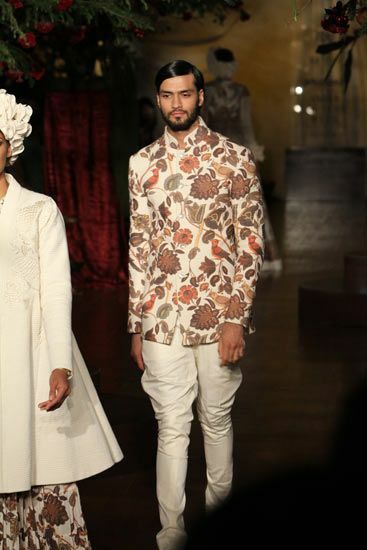 Indian men's couture is full of outfits for men that have a dhoti pant! 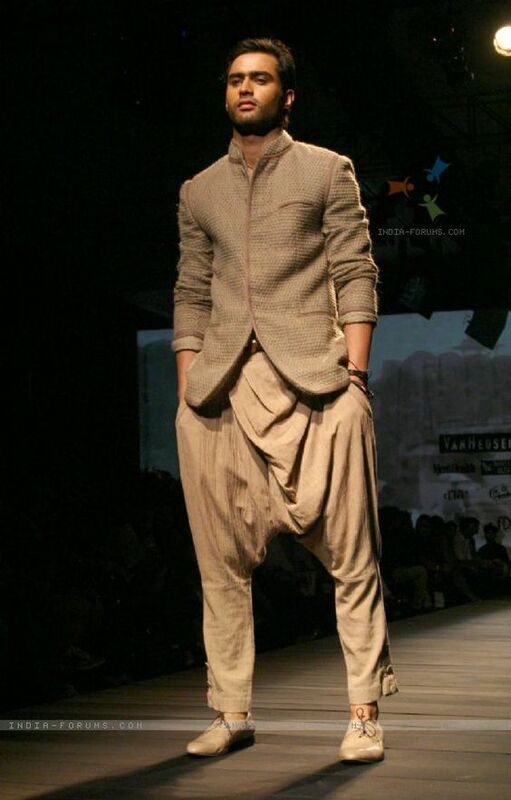 Now shed the fear of your dhoti being pulled open with stitched dhoti pants ! 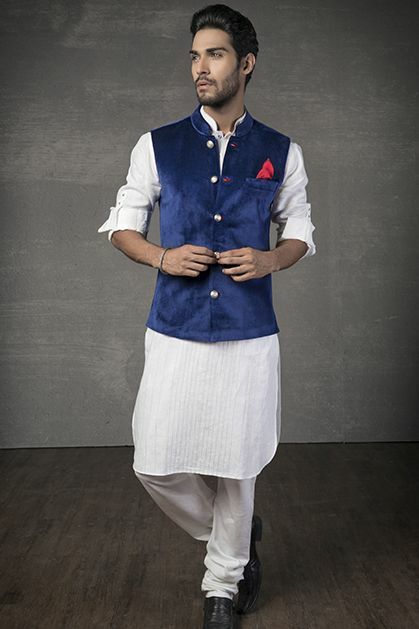 Style em up with your kurta or sherwani for a stylish look ! Want a greater impression but yet want to look semi formal? 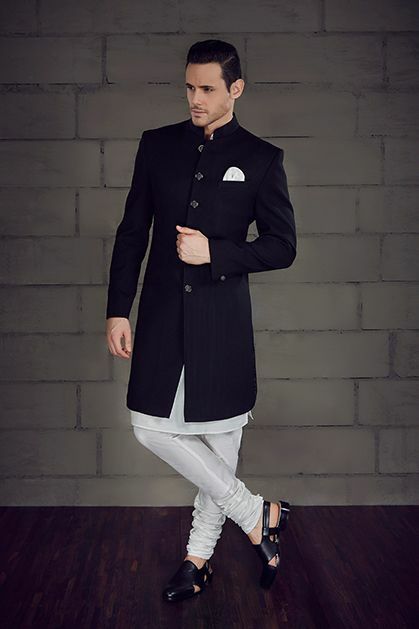 Go for the utterly impeccable groom suit with sneakers for guys to impress your fiancees to the core. Choose the right size. Period. (YES ! Please ) as there is nothing that screams ‘I don’t have my life together’ than an ill-fitting outfit. 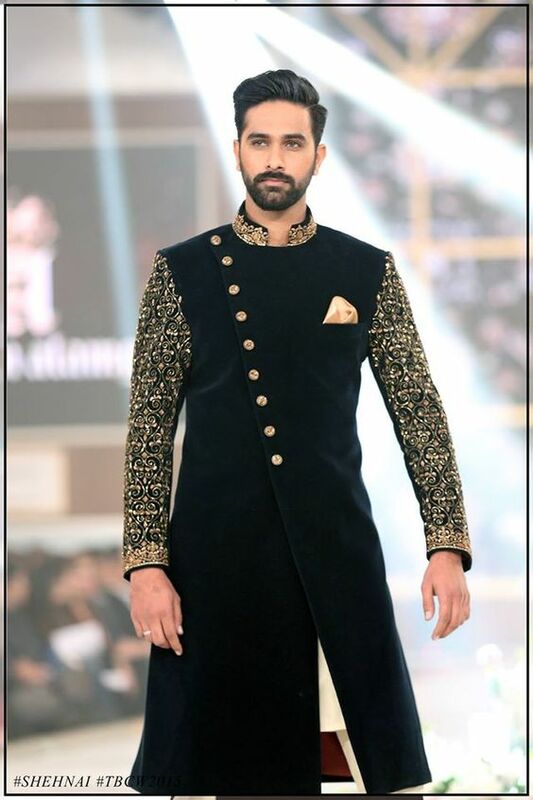 A sherwani might be a go-to option as most men find it very troublesome to take out time to shop or even try something new. 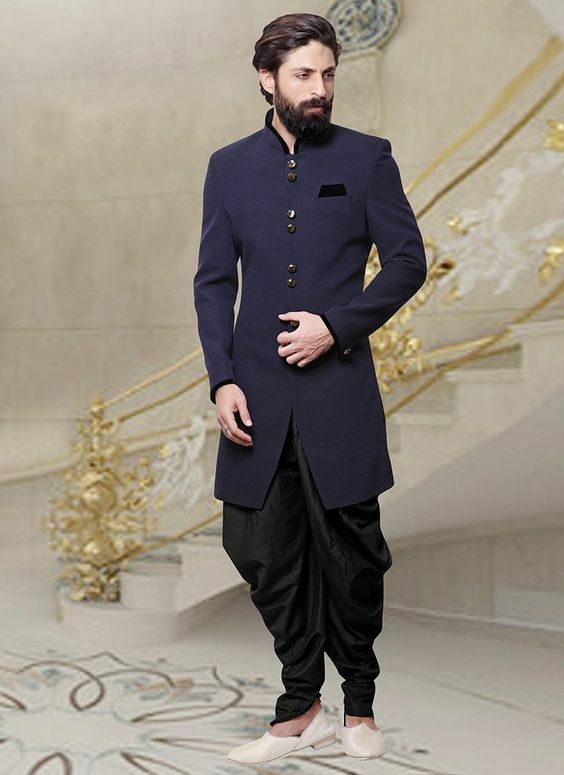 If sherwani is your choice then make sure you have fun with it. Get your creativity out , mix and match and customize your outfit to color coordinate with your partner. 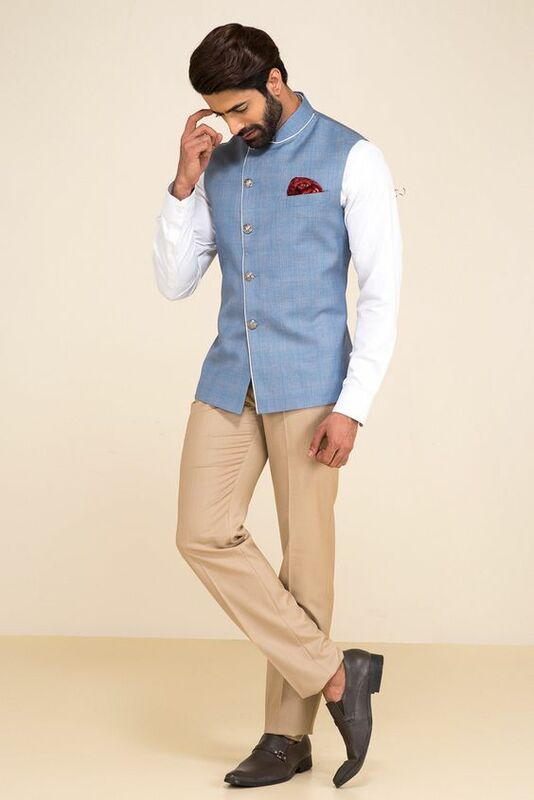 Majority of the men's wear have standard colors like grey-white,black & white or beige and white , the waistcoat does offer you a chance to be a bit creative. Try wearing waistcoats in bold colors or bold materials like velvet ! Don't wear something uncomfortable or anything which is out of your league. You want to feel comfortable and confident in what you wear. Express your personal style while dressing up for your engagement ceremony. The more confident you feel, the better your photos will turn out! Its obvious you will be getting the whole engagement ceremony captured and you will be clicked several times, wear a smile as it is the best accessory ! If you are not the experimental type , its best to stick to plain black ! Black can never go wrong fellas ! 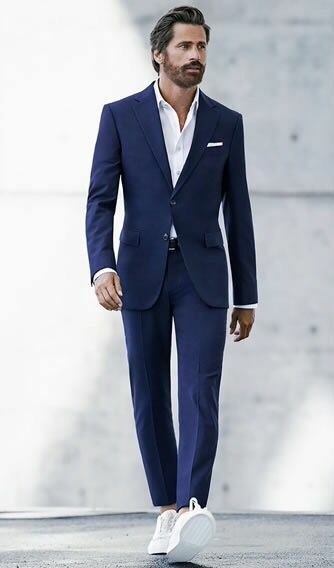 Whatever you opt to wear make sure it is well fitted and is a well-put together smart tailored outfit. Engagement dresses for men look stunning when they are styled up to perfection ! 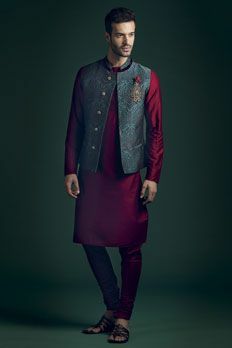 Indian engagement dress for groom does not follow any strict guidelines which is why you don’t have to stick to strict dress etiquette. 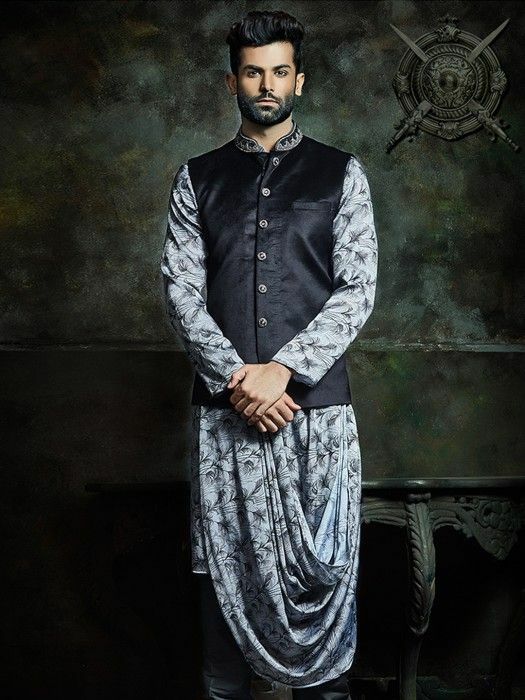 You can ditch the traditional sherwani for a Indo-Western outfit or Kurta-Pyajama which is formal and stylish, whilst not being quite so full on. If you are opting for formal suits which can be quite boring , you can amp up your engagement dress style by wearing stylish shoes with it. 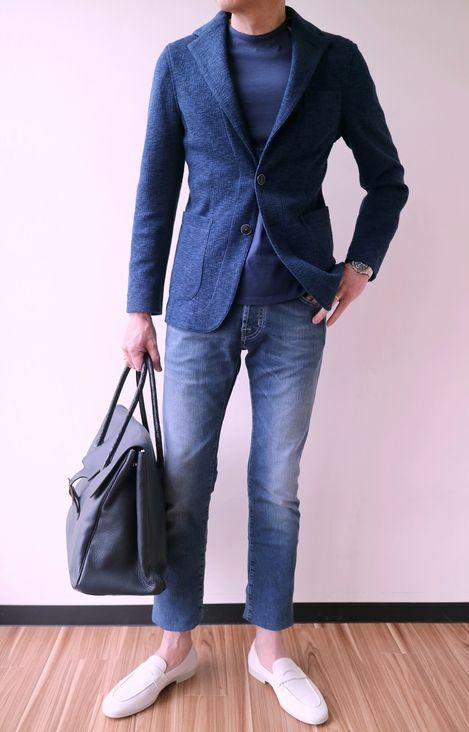 Finish the look off with a pair of brown oxford or leather shoes. This will keep the outfit from becoming too formal and adds even more stylish detail that you wouldn’t get from black shoes. As I have stated earlier, your engagement ceremony must not be taken lightly. Redefine your choices and dress up to the mark . Do not compromise on any of your dressing choices after all a man get's engaged only once in his lifetime ! 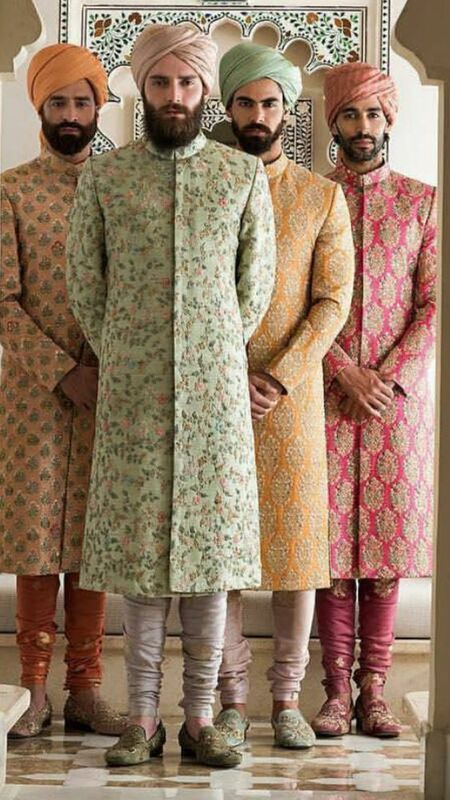 Do you have more Indian Engagement dress For groom ideas? What is your choice of attire when it comes to your engagement ceremony? tell us in comments below.